The Bold and the Beautiful (B&B) spoilers for the next two weeks tease that we’ll see desperation and destruction on the CBS soap. During the week of February 11-15, Florence “Flo” Fulton (Katrina Bowden) will realize she’s in deep trouble. After lying to Zoe Buckingham (Kiara Barnes), Flo will reach out to Dr. Reese Buckinham (Wayne Brady) and insist their scheme is crumbling right in front of her. Before Flo can figure out her next move, Zoe will be back for another faceoff. This time she’ll plan to call the cops or Steffy Forrester (Jacqueline MacInnes Wood) herself if Flo doesn’t cooperate. The pressure will be more than Flo can bear, so she’ll break down and make a confession. Flo won’t reveal all the details, but she’ll admit she’s not the birth mom and was involved in a plan with Reese. The Bold and the Beautiful spoilers say Zoe will ponder that crazy news and contact her father. She’ll want to know what in the world Reese was thinking. Zoe won’t understand how Reese could do something like this, but things should get even worse once she figures out the whole truth! Meanwhile, Hope’s connection to Phoebe Forrester (Isabella de Armas and Redford Prindiville) will become concerning. Steffy doesn’t mind her bonding with the baby, but there’s a fine line between showing love and becoming completely obsessed. Unfortunately, Steffy will fear Hope’s veering into the latter territory. Liam will rush to Hope’s defense, but he’ll certainly have concerns, too. Other Bold and the Beautiful spoilers say Thorne Forrester (Ingo Rademacher) will spoil Katie Forrester’s (Heather Tom) Valentine’s Day surprise with one of his own. It looks like he’ll insist that they’re not a good match and should just part ways. Naturally, Katie will be blindsided by the split suggestion. She’ll feel like it’s out of the blue and totally baffling. Katie thought they were on solid ground, but she was obviously wrong. 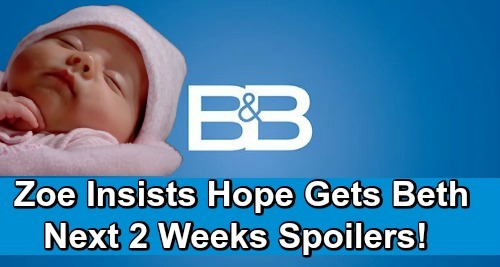 B&B fans can expect Katie to seek Wyatt Spencer’s (Darin Brooks) support later. She’ll be an emotional wreck as she deals with this apparent divorce bomb. Over with Bill Spencer (Don Diamont), he’ll consider his romantic future. Bill’s been bonding with Will Spencer (Finnegan George) and even Katie lately. He’ll decide it was a mistake to throw his family away, so he’ll wonder how he can put it back together. Bill’s right-hand man, Justin Barber (Aaron D. Spears) will definitely chime in on that. During the week of February 18-22, Katie will spread the word. She’ll fill Donna Logan (Jennifer Gareis) and Brooke Forrester (Katherine Kelly Lang) that her marriage to Thorne has fallen apart. Katie still won’t understand why Thorne was so determined to end it, but she’ll try to accept his decision. It’ll be painful, but Katie will feel like she should come to grips with it and attempt to move on. Back with Zoe, she’ll put the rest of the puzzle pieces together. Zoe will realize Hope is Phoebe’s real birth mother, so she’ll rage over Reese’s deception and push for Hope to know the truth. She’ll feel like Hope deserves to know Phoebe is actually the presumed dead Beth Spencer. Reese and Flo will do everything they can to convince Zoe to keep her mouth shut. The Bold and the Beautiful spoilers say Zoe will feel backed into a corner, so she should ultimately have reservations about divulging this shocker. We’ll give you updates as other B&B details emerge. Stay tuned to the CBS soap and don’t forget to check CDL often for the latest Bold and the Beautiful spoilers, updates, and news.